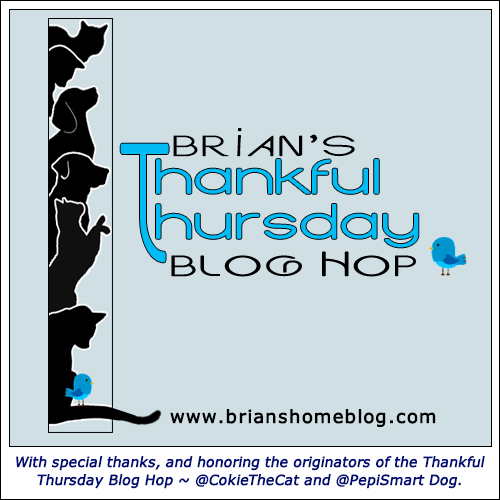 Hello everyone, we’re back for our Thankful Thursday Blog Hop. Needless to say it’s been pretty sad in our neck of the woods since the departure of Sister Sascha for the Rainbow Bridge last Friday. We hadn’t lost one of our own since my Brother Ivan ran off to the Bridge in 2009. I never thought that a sweet Sister younger than me would be departing and we miss her terribly. I want to thank you all for the outpouring of love and kindness. The Dad and Mom read us each of the comments and, as you can imagine, there were many a wet whisker. The tributes you left were most wonderful and I know Sister Sascha would have been deeply moved to know that she touched so many hearts. The Facebook posts and Twitter messages were so numerous it was hard to keep up, but I think we’ve managed to read them all. Thank you for being there for all of us during our time of grief. Please know that each of you are important to all of us and you each helped us along on this unexpected journey. What are you thankful for today? Tell us in the comments and then join us for our Thankful Thursday Blog Hop, we’d really like that. Remember, adopt cats, we deserve it!!!!! More Forever Homes More Often! Purrrrr! Zip! Later! Brian wee ALL miss Sisfur Sascha so-o much!! It must bee so hard fur all of youss’….it sure has been a long time since Brofur Ivan left fur Pure Land. Mee iss fankfull fur you an yur furendship. Mee iss fankfull fur LadyMum an Mumma Mary-Ellen. Mee iss fanfull mee iss alive an here with all of youss’. We are mostly thankful to see your adorable face and to know that although you are sad, you will still find things to be happy about and things to look forward to together. Sister Sascha will stay in your hearts for as long as you live. It is very sweet that your pawrents read all the messages to you to help you know how many people loved Sister Sascha and how many love all of you. Have a nice nappy there, Brian. Mancatly hugs! We’re thankful for furiends like you and your family, Brian. We send you all lots of purrs and love. There is so much kitty love at Brian’s Home, that we all tap into it! And the lose of one beloved sends a charge of sadness out into the world. Wish I could hug all of you, cats and humans. I am thankful for my job and a pretty good work environment. I’m so thankful that your family are among my good pals! I really love seeing you all, and have missed you for the past few days while you’ve been grieving. We’re thankful for YOU, dear friends. Much love to you all. How can we not be thankful to have such a community of friends who support and love and are there when we need them. What a wonderful community this truly is, especially when it includes wonderful families like yours. We are so thankful for that. We have all been thinking of you and sending you our purrs and prayers. May you find peace in the beautiful memories you share with your sweet Sascha. I am so sorry to hear that Sister Sasha has left to cross over the Rainbow Bridge. She will be missed. We are so glad to see you back. We missed you a lot, although we understand that you needed the time to get over the shock of Sister Sascha’s loss. She was a very special girl and will be missed by all of us, but we also look forward to enjoying your continuing adventures. and lots of wonderful cats and critters. We are also thankful Sascha had such a loving,caring family. (hugs) we are thankful for YOU and your wonderful family. We are so very sorry about Sister Sascha. One day Sister’s Sascha’s death won’t hurt as much but you will always miss her and love her. Love lives forever. She’ll sure always be remembered. Finding the thankfulness helps one carry on indeed. You sure do look comfy today too. I’m so thankful for this loving community that supported you and sent so much love your way. We will miss Sister Sascha so much! We are so thankful for all of you wonderful cats and peeps too. We sure think about you every day and your loss. We so welcome you back. We sure did miss you and miss Sascha too. You all have a super day and try to stay warm. We still can’t believe we won’t see that beautiful girl with the lion cut anymore, but the heartbreak you all as her family have is so much more. We send lots of GBGV hugs. Sascha would want you all to keep going and remember all the good times with her. Be thankful for the time you did have together. We miss Sascha, seeing her sweet face, so of course, we know how heartbroken you all are. We are thankful for all of you. We always love your posts. *tears* Even now as I write this, tears come. I am so sorry for your loss. We loved Sascha. I know she is missed and very much loved. I am thankful that Sascha had you for her family. You are blessings to so many. Hugs. We are thankful for your family and all the loving hearts that surround you…We are sending big hugs for continued healing! We miss the friends who have gone and are thankful for the ones we still have and will make in the future. We are thankful that you all are finding your way after such a loss. We love you. Losses teach us, what lesson we learn is unique to each of us. But, we know too how empty a house feels after one of our beloved furries leaves us, especially unexpectedly. I suppose we always feel it is unexpected, and no matter what we are never prepared. I hope that grace finds you and that the love shines bright from your lovely Sascha from that beautiful spot at the RB. Thankful for your wonderful friendships. Lots of hugs and love to you all. Grief is a journey we each walk through on our own, even when so many others care. Give yourselves the time and space you need. Purrs from Nicki and Derry. We too are thankful for sister Sascha and all the love she brought to your home. We are also thankful for you and your sisters and brother and your parents who have brought much joy to our life through sharing yours! Agradecemos pela vida, família e amigos adoráveis como vocês. Continued hugs and kisses from all of us. We couldn’t imagine how tough this time is for all of you. We’re still sending you lots of hifs, and we’re going to meow for Sascha in our Facebook page in Caturday night. Today we’re thankful for friends. Sorry about Sister Sacha. I’m thankful for my cat, Daisy Mae doesn’t have a heart murmur anymore. I am thankful that your family gave Sister Sascha much love and all the care, food and toys she could ever want during her life. She was a Princess and now she’s met up with Brother Ivan and they both wait but at least they have each other. I know she never knew Ivan but he knew her instantly since he’s always looking down on you. Sending hugs and kisses to all. We understand the pain of loss all too well. Hugs to you all from all of us. Take comfort in knowing that you went above and beyond in your efforts to help her and that now she is at peace. Purring lots and lots fur all of you… we love you furry much. There is no time limit on grief. We know Sister Sascha was loved and that you miss her every day. We’re sending lots of purrs and hugs for you. We are so very thankful that you are with us Brian and that you all have such wonderful mom and dad to look after you all. AND we are thankful that there are so many good folks like yours who are adopting and saving lives. Mommy and I truly love each one of you…fur and human. And we are grateful for your presence in our life and hearts. Our family here in the Cat Blogosphere is just that, a family. And all that affects one of us affects all of us. So glad to see you all again and to know that each member of the family got to hear our love. A beautiful day in the midst of cold and gloom and I’m thankful I was able to get out and enjoy it. It is so hard to lose a beloved family member and Sascha was definitely loved. We are thankful for your friendship. Healing from a loss is a journey, not an event. We know that any journey is a little easier when you have friends along the way, so we’re so glad that the blogosphere has been there for you. We are glad you are back. Adjusting to the absence of such a wunnerful Sister is hard, but the household must go on. Memories will be precious. I am so very sorry to read of Sister Sascha’s trip to the bridge. I’ve been deep in the desert with no internet for a long time. I send love and hugs to all of you. I am so very sorry. I’m thankful that the blogging community is filled with so many compassionate pet lovers. 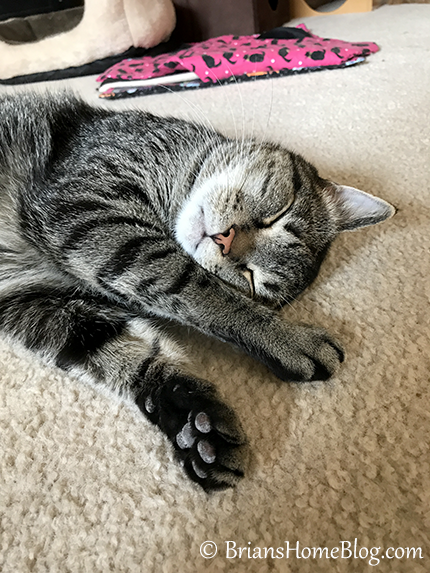 Most of us know how difficult it is to have a sick pet or lose one of our furry family members and we’re always supporting each other through difficult times. I am thankful that the three Foster kittens we had have left to live in a safe pawsome free roaming kitty rescue where they will for sure find their forever homes. We are still thinking lots about you! Glad you still can find much to be thankful for! Brian, it is good to have you all back. We miss your sweet Sister Sascha but thankfully there are a LOT of pictures of her here on the blog for safe keeping. Hugs to all of you. Awwww Brian and furmilly we are so furry sad fur mew all and know how mew feel, it’s awful, really awful but the sadness fades and the happy memories remain fureffur. We’re making a memorial mandala fur Sascha and will let mew know when it’re ready.